Minor prophets, I gotta give you props. You were by far the most difficult section of the Bible to design. Week after week of judgement, condemnation and more judgement. Rarely did you burst into flowery language like Psalms or Song of Solomon. You were the cardboard to their beautiful wrapping paper. You were the low fat Flavorite microwave popcorn to their fresh from the kettle, covered in butter and cheese dust popcorn from Candyland. You were the Maroon 5 to their Radiohead. But guess what? I'm done with all twelve of you suckas! I took your blandness and squeezed out design rainbows and unicorns. Put that in your pipe and smoke it! OK, maybe I really shouldn't pick fights with people who have books of the Bible named after them, but dang they were difficult. How many times do I have to see a Jumping Cow design? 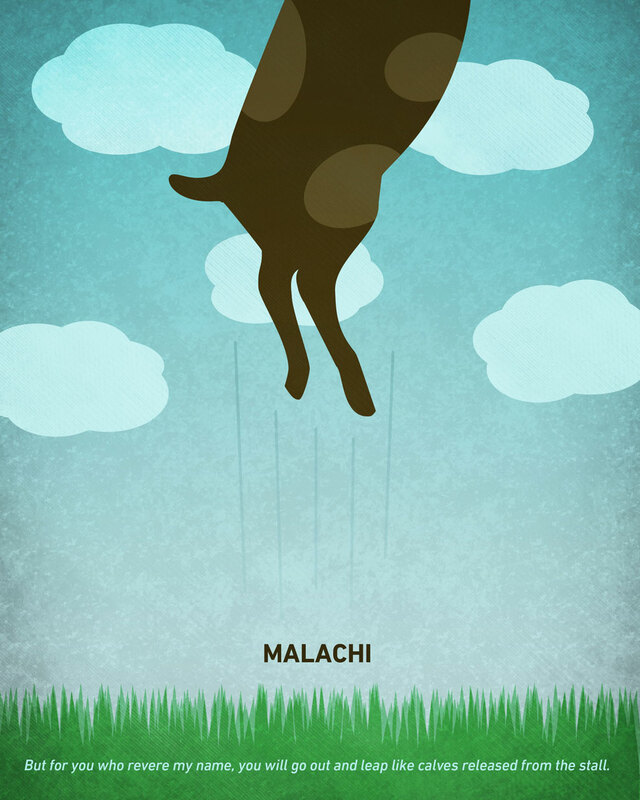 A bunch of people have emailed me recently saying "Hey Jim, I know you are closing in on Malachi and I just wanted to implore you not to do the jumping calf design. We've all seen it done before and we really are hoping for something a bit more original from you." Sorry. Immediately in chapter 1, Malachi is like "What's up?" and lists all the ways that the religious folks have been disrespecting God. In the second verse of the book, it even says that some of the people were even questioning whether God even loved them or not. I realize that doesn't sound like a big thing these days, but to say that in ancient Jewish culture was a major thing. God, the creator of the universe, had been chasing after them, working with them even though they continually screw up and now, after all that, they're confused as to whether or not his actions qualify as love? What more do they want? Here's where if I was God I'd be like "OK. Forget it. You're on your own. See how it goes without me, losers." I'm not sure how much you know about the New Testament, but that's not exactly what God ends up doing. Old Testament, you got Worded.